These new Deluxe Pilots are sand cast Navy Brass with drilled out and lightened uprights. 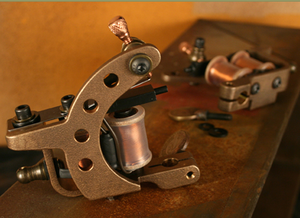 They have an Antiqued finish and are built with custom 1.125" 8 Wrap Coils, natural coil wire, clear heat shrink, 1/8" yoke, Deluxe Brass Turned Hardware, and an Antiqued Brass Workhorse Thumbscrew. 8.6 ounces. Shaders - Long stroke, solid hit, great for color work, push 5's to 9's with ease. 100-105 Hz at 6.5 V unloaded.